Experience the excitement of the Race Track with guided tours and on-track tours aboard the Motor Shuttle! The tours will be held in both Italian and English Language. Reservation can be made in person up to 30 minutes prior to the start of the tour. 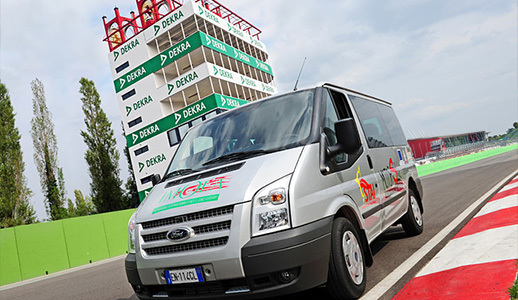 Exclusive race track tour on board of Motor Valley shuttle bus stopping at the main points of interest: Ayrton Senna memorial, box, pitlane and panoramic view of the circuit from the Dekra Tower. Starting time: 1.00 pm Duration about 1.15 hour. Cost: € 30,00 per person, € 20,00 kids under 16, free kids from 0 to 6 years old.